Ukraine’s Prime Minister Arseny Yatsenyuk branded some MPs “morons” as a mass brawl broke out during his speech at the Verkhovna Rada in Kiev. Posted by RT Play on 11 декабря 2015 г. The fight began between MPs from the president’s Petro Poroshenko Bloc (PPB) and Yatsenyuk’s People’s Front (PF). It allegedly all started when Oleg Barna (PPB) went up to the tribune while Yatsenyuk was giving a speech, presented him a bouquet of roses and then tried to carry him off the stage. Barna’s actions led to a fight that disrupted the PM’s speech. The brawl continued for several minutes involving members from both parties, although some were clearly confused, as seen in the video. When everyone had calmed down, representatives from both the PPB and PF apologized. Oleg Barna was excluded from the Rada later that day. 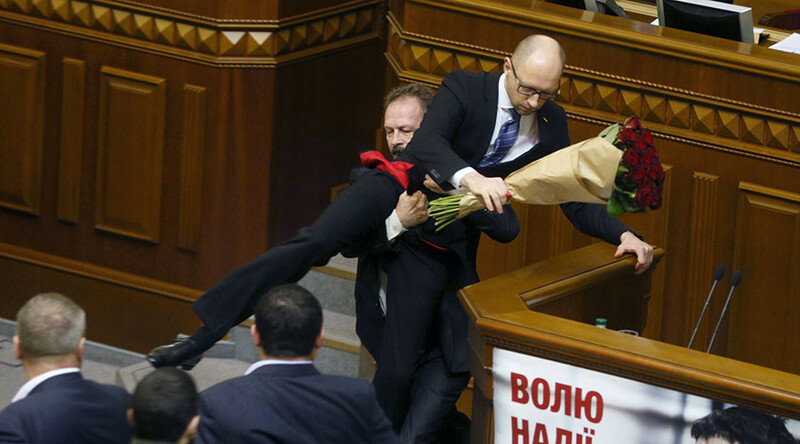 Fisticuffs in the Ukrainian parliament are far from infrequent. In fact fights break out so often they have fueled a meme called ‘Accidental Renaissance’, when ugly fights in the Rada are depicted in photos resembling Italian art due to their perfect proportions. Internet users have rapidly reacted to the bizarre photos coming from this latest parliament session in Ukraine giving rise to a fresh meme starring Arseny Yatsenyuk.